Hey everyone! I apologize for being a little absent on the blog this week... I've been bouncing back and forth between several different projects. Very soon I shall have some finished things to show you! What have you guys been working on? Are you like me with a short attention span for a particular project when another idea pops into your head? Do you have trouble balancing things you have to get done with things you want to get done? And if so, any methods for dealing with it? This looks like a beautiful big daisy! I'm always balancing the things I love doing ... and I never seem to find enough time to read! same here!!! I have a loooong list of things to complete, but always something new in my head, then in my hands!!!!!! 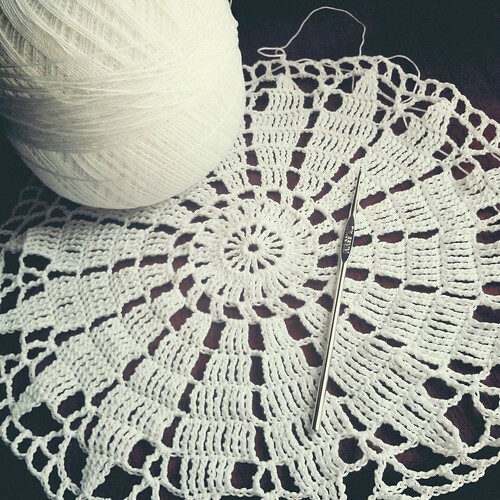 btw, your doily is gorgeous!!!! No, I haven't seen that!!!! That's so cool, thanks so much for sharing!!! I'm going to have to put that on my wish list! Thank you!! I will keep reminding myself about enjoying the journey! I agree! I often think that the process is much more important than the final outcome!